I signed up with a wind farm developer in 1997 to host wind turbines on my farm. I thought it was good for the planet and as I was getting on a bit in years, it would be a nice supplement to my retirement income. I was so convinced that it was a good idea that I also convinced my neighbours and my brother (who was vehemently against anyone tampering with his land) to sign up to an option to lease to host wind turbines. The option to lease was a binding document that prevented us in any way from backing out of the deal. I had no concerns with the document because I was informed confidently by the developer that I would not hear the turbines above the ambient noise level. That subsequently proved to be very much a lie. Many of the landowners who host the turbines do not live anywhere near the turbines and I am aware of at least one non-host landowner who is receiving “good neighbour” money in exchange for their silence. How many others receive what amounts to little more than a bribe? What about those wind turbine hosts with children? There are more and more reports of children being harmed by these machines, and these agreements prohibit their parents from complaining about what amounts to abuse of these children. What about their rights to a good nights sleep – so essential for their growth and development? The turbines were installed and commissioned in 2004. Because of the loud audible noise made by the turbines on our farm (each about 750 metres from our house), my wife and I decided to build on a 10 acre block of land 2.5 km from the nearest turbines and still only 5 km from our farm, so that we could still comfortably run the farm. At the 10 acre block, we could neither see the turbines nor hear them unless the wind was blowing directly from them, and then the audible level was generally low enough not to be too annoying. For the next 14 months, my wife and I spent our waking hours building our new home (just the two of us, every brick and stone and the entire fit out) in addition to running our beef cattle farm. Needless to say, we were very tired at the end of each day. At the end of the 14 months, we moved into our new home although it still needed painting and tiling etc. Almost immediately after we moved in (September 2006), I started to develop problems such as nocturnal panic attacks, loud tinnitus, deep fits of depression, and apparent heart arrhythmia to name the most prominent. I consulted my doctor about my heart appearing to miss beats particularly if I was inside the house. My doctor could not find any problem with my heart. The panic attacks, I put down to living in a new strange house and the depression to working too hard. I wondered if my problems were pesticide or herbicide related but ceasing their use for a year did not alter the symptoms. I wondered if I was being oxygen deprived by the lounge room slow combustion heater but the symptoms were still there in the summer months. I could not sit in my recliner without feeling as though I had an x-ray blanket pressing me into the chair and I couldn’t get up from it. When I went to bed, it felt as though I had just run up a flight of stairs. I gave up and considered that I had built a “sick” house. We have had acoustic logging of the inside of our home over a one month period. The data shows a very high level of infra sound at around 4Hz as well as low frequency sounds at around 50Hz. The infra sound detected is consistent with what one would expect from the number and location of the wind turbines adjacent our home. The 50Hz noise can not be emanating from appliances in our home because our power supply shuts itself down when there is no demand as it does frequently during the night. The 50Hz was omnipresent. It is all becoming rather telling, don’t you think? I spent 23 years in the Royal Australian Navy, a good deal of it as an electrical engineering officer. Honesty and integrity were and still are part of my way of life, yet wind energy proponents , various media outlets and people in high office, publicly question the veracity of my statements in places that I do not frequent and therefore have no chance to refute this questioning. At no time do these denigrators ever contact me or visit to find out the truth for them selves. Instead, they hide behind media pseudonyms and I am labelled “high profile, anti wind farm activist”. I am a recently retired farmer and former naval engineer trying to enjoy the rest of what life I have left. 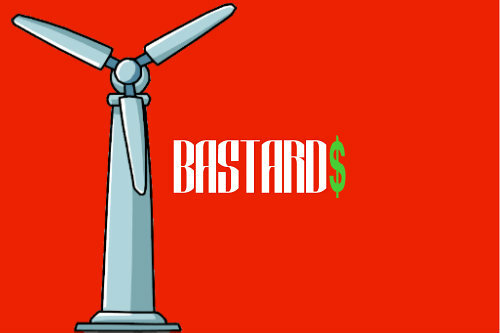 I certainly don’t want to spend it protecting my health which is being destroyed by totally ruthless wind power developers who have utterly no interest in the environment or the rural communities and whose sole aim is to make as much money from the gullible politicians and general public as they can and seal their deals with lengthy, binding contracts enshrined in law. As time goes on, the number of people becoming severely affected is going to grow, and those people affected will continue to deteriorate. In short, the effects are cumulative. The consequences of severe chronic sleep deprivation and chronic stress are well known to clinical medicine. Mental and physical health are irreparably damaged. Sleep deprivation is used as a method of torture. Personally, I am getting very tired of being the guinea pig and being considered as collateral damage or mere political road kill. David, well done on writing the letter about your experience on living with wind farms. I fully sympathise with your plight, and that of many other wind farm neighbours. Both my wife and I in rural Wales can hear wind farm low frequency noise on occasion. My wife started hearing LFN in the winter of 2006. We didn’t realise the cause until 2 years later. In the meantime we met other people who could hear the dreaded LFN – all started hearing it at around the same time. I discovered a wind farm of 16 turbines became operational in the autumn of 2006 – 40 km (25 miles) from our home. We were away in Oct & Nov 2006. On our return my wife started hearing the LFN immediately. For months she thought it was planes flying overhead. Another person we knew (Sadly, he has now passed away) used to drive around in the middle of the night looking for the bugger driving the big machine. Every time we had a stable high pressure system with the wind blowing from the direction of the distant wind farm (40km SSE) my wife invariably heard LFN in our home. All our observations supported our hypothesis that the above mentioned wind farm was the probable source of the LFN my wife regularly heard. Our Environmental health officer made a sound recording in our home in June 2009 when my wife deemed the LFN to be loud. All the noise in the normal hearing range was below 10dB. The loudest noise was in the low frequency spectrum, with peak dB readings being recorded in the 16-20 Hz spectrum. The recording instrument was only capable of measuring noise between 10 and 20,000 Hz. The noise recorded corroborated what my wife could hear at that time. In Sept 2009 another wind farm became operational only 13 km (8.5 miles) W from our home. Last year we had an unusual weather pattern – a stable high pressure and a westerly wind. My wife could hear LFN constantly for a month. A couple of days into this period my wife became progressively ill over several days. Going out shopping initially triggered a quick recovery, but as time progressed, going out for a few hours did not initiate any recuperation in her symptoms – identical those labelled under “wind turbine syndrome.” She was ill for over 1 month. After the weather system broke the LFN abated. Several days later my wife slowly started to recover from her ordeal. She gradually recovered her health over a period of about 10-14 days. It’s not something she wants to experience again, but with several more wind farm applications being passed at varying distances from our home the chances of my wife having a repeat of her illness is very high. We can’t even see a single wind farm from our home. Our thoughts on the “nocebo” effect can be summarised as – bullsh*t.
On the information I have discovered I believe that our govt and the windustry are complicit in inflicting torture on law abiding citizens living in their own homes. Suspected and convicted terrorists have more human rights than us – they’re not allowed to be tortured – it’s against their human rights. What human rights do ordinary citizens have when being tortured by noise emissions from a wind farm? … Bugger all from what I have learned. Shameful on our govts and shameful on the windustry. My only hope is that they get enough rope so they can hang themselves (metaphorically speaking) – the sooner the better. Thank you for sharing, especially about feeling the effects of low frequencies for many many miles.